The best hotels and restaurants in Bulgaria were distinguished on an official ceremony. The best hotels and restaurants in Bulgaria were praised on an official ceremony. The Bulgarian hotelier and restauranteur association distinguished the best hotels and restaurants in Bulgaria on an official ceremony on 5 December 2011. In 2011 the new categories are: “Eco complex”, “Mediterranean restaurant”, “Casino hotel”, “Foreign hotel manager”, “Contribution in personnel training and education in the field of culinary art in Bulgaria”, “Contribution in the prolonging of the tourist season in Bulgaria” as well as a special reward for “Following the rules and regulations for smoking on public places”. - “Four star city hotel for 2011” - hotel “Danube” - Silistra. - “Four star mountain hotel for 2011” - “Iglika palace hotel” - Borovets. 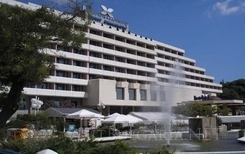 - “Four star Black sea hotel for 2011” - hotel “Regina Maria Spa” - Balchik. - “Three star Black sea hotel for 2011” - “Grifid hotel Vistamar” - Golden sands. - “Boutique hotel for 2011” - hotel “Vega” - Rousse. - “Balneohotel for 2011” - hotel “Sandanski”, Sandanski. - “Spa hotel for 2011” - Spa club Central, Hissarya. - “Eco complex for 2011” - Eco hotel “Sherba”. - “The est family hotel for 2011” - “Villa di Poletta”, Dobrich. - “Aparthotel for 2011” - Aparthotel Lucky Bansko – Bansko. - “Casino hotel for 2011” - Hotel Colosseum, Sunny beach. “Classic restaurant for 2011” - restaurant “Nova Mizia” - Targovishte. “Gourmet restaurant for 2011” – restaurant “Panorama” - Shoumen. “Mediterranean restaurant for 2011” - mediterrenian restaurant “Polmary” - Sandanski.